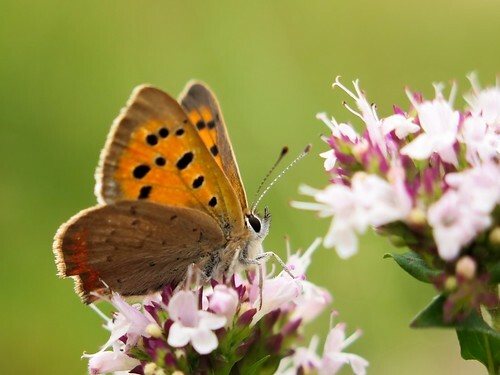 Like the bees in my last post – butterflies are summer’s companions. Whilst the bees add movement and sound, their gentle buzz providing the background to many a summer’s day, the butterflies are all about the flair and colour. Below are a few of my favourite encounters as we moved through 2017. This is a species I have only ever seen briefly before, flitting in the low grasses as we walked The Ridgeway through Oxfordshire a few years ago. 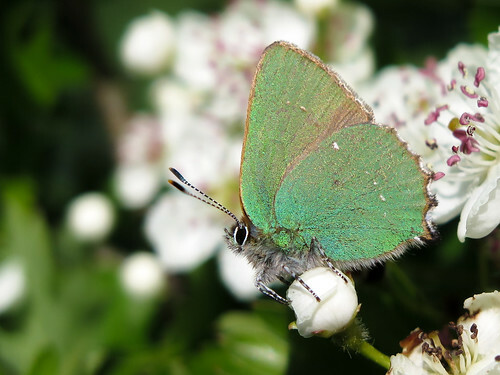 A hunt around Barnack Hills and Holes in May soon turned up a hawthorn shrub with several males standing guard over their patches of territory. This one was settled on an unopened flower bud, poised and ready to spring into the air as soon as another flew past and questioned his ownership of this space. You can read more about this encounter in this blog post! 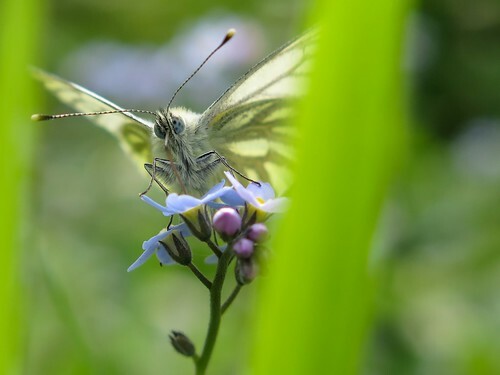 With the exception of a couple of rarer species, it is easy to overlook our white butterflies as most people view them as pests in the garden. But like almost anything – they’re beautiful when viewed in their own right and on their own merits. My favourite part of this photograph is those chequered blue eyes as this butterfly feeds on forget-me-not flowers at Treswell Wood. 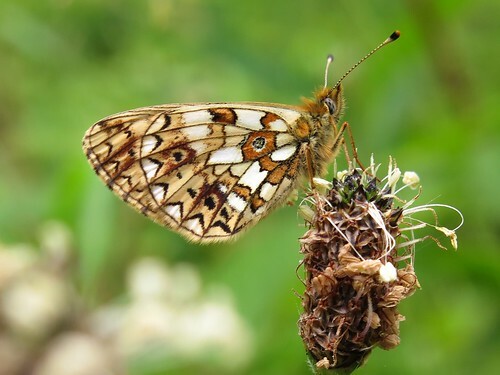 We were walking through the dunes and forest at Newborough in Anglesey in May and spotted this static shape at the side of a path – a small pearl-bordered fritillary resting on the seedhead of a plantain. It’s rough brown textures gave it excellent camouflage. This species is widespread across the UK but only occurs in discreet colonies, commonly in the clearings in deciduous woodland but also marshland and moorland further north. This is a common species of grassland and woodland habitats, but one which always delights me. The veins in the soft-brown wings are such good parodies of those found on the leaves it settles amongst, and the five eye spots are striking. 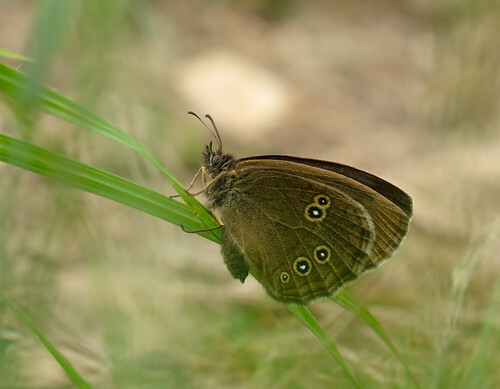 This photo was taken at the Hills and Hollows behind Grantham, the butterfly sheltering amongst the grass on a windy afternoon. This white is actually more closely related to the browns than the other whites, despite name and appearance. It is a species I usually associate with the counties of Warwickshire and Oxfordshire as these are where I have encountered them most often on walks and surveys, so it was lovely to find a healthy population down the road in Bedford Purleius. 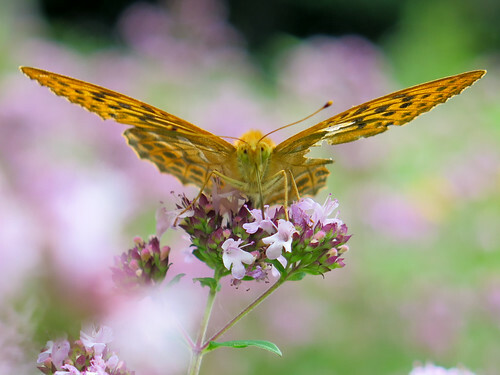 This was taken in the meadow close to the carpark, along with the silver-washed fritillary pictured below. Burnet moth – Zygaena sp. Technically not a butterfly but a dayflying moth, I felt I had to include this photograph. 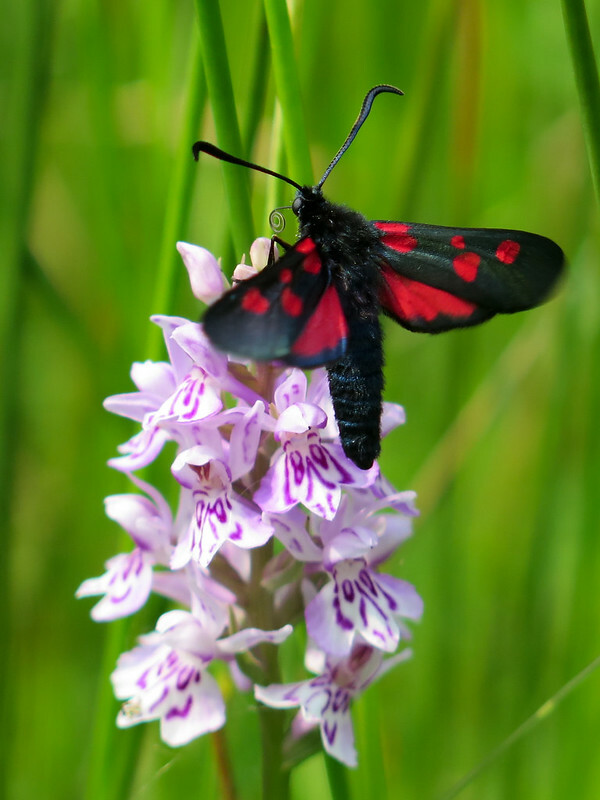 This was taken at Lolly Moor – a Norfolk Wildlife Trust reserve – when I called by this year. The marsh helleborines were my main aim but there were many other orchids and these burnet moths were bouncing between them. This is one of the five-spot burnet moths, but I am unsure whether the ‘regular’ or the narrow-bordered. Any tips welcomed! Some years I see this delicate little butterfly everywhere but others it is a real treat to encounter. Sadly 2017 was the latter – the only time I came across this species was whilst walking on a path above the Thames in Oxfordshire. The set-aside margins in the fields were particularly species-rich, drawn from the local wildflower meadows, and this was one of several species of butterfly enjoying the flowers on the day we were there. 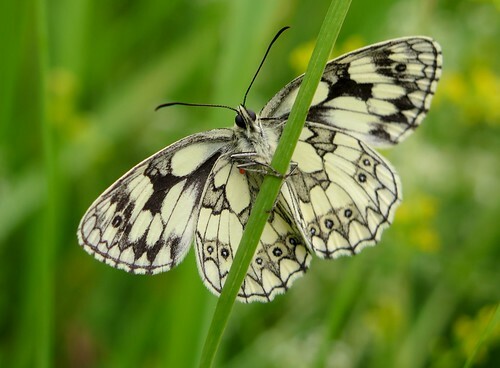 This was a rather ragged specimen but its grace and presence was un-diminished – they stood out a mile flying alongside the marbled whites in the meadow at Bedford Purleius. This is our largest fritillary species in the UK and gets its name from the streaks of silver on the underside of the wings. A walk from Cheddar up the gorge to the quarry at the top rewarded me with this butterfly. 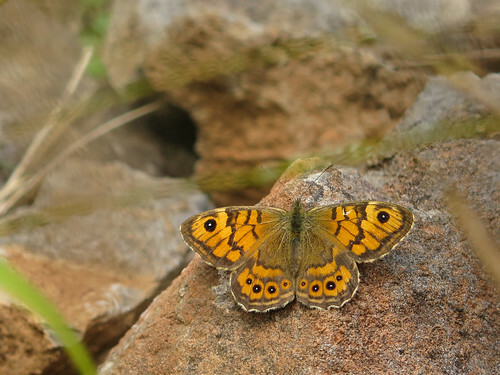 The wall used to be much more common across the UK but suffered severe declines and now has a much smaller distribution. This is certainly the first time in a number of years I have come across this butterfly. 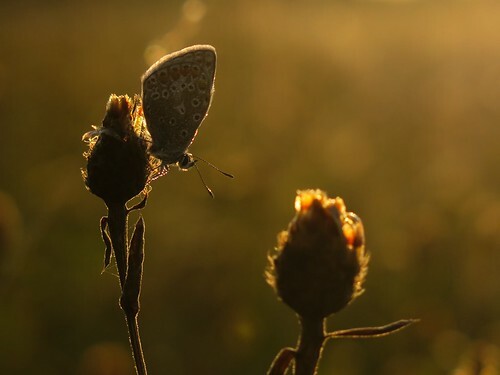 Taken at sunrise in Muston Meadows, this common blue had spent the night roosting on the seedhead of a black knapweed and was waiting for the morning rays to warm it before taking to the wing. These little blue butterflies are abundant within the grasses, feeding particularly on the bird’s foot trefoils and other meadow wildflowers. 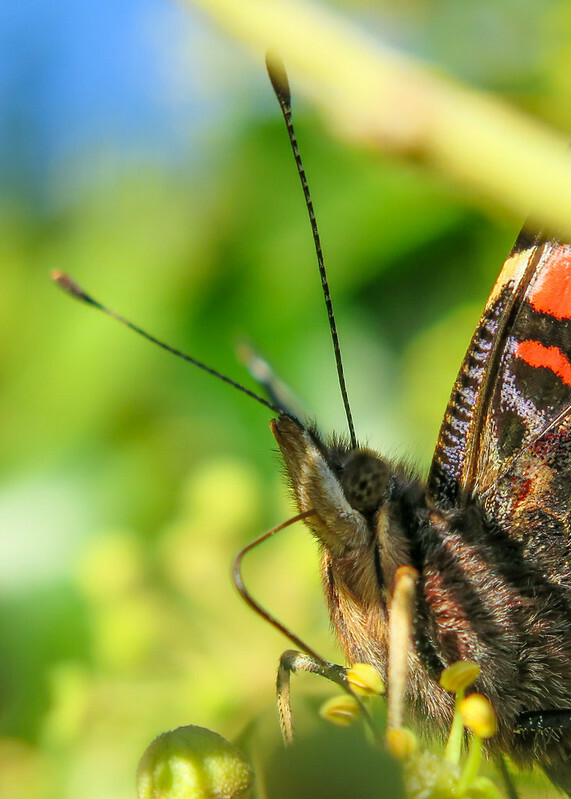 The last butterflies I saw in 2017 were those set to see out the winter in their adult form – the red admirals, small tortoiseshells and peacocks. Ivy flowers provide an abundant source of nectar for these late-flying species and they joined the bees and hoverflies on the flowers beside Grantham Cemetery. butterflyanglesey, Aphantopus hyperantus, Argynnis paphia, Barnack, Bedford Purleius, Boloria selene, burnet moth, butterflies, butterfly, Callophrys rubi, cheddar gorge, common blue, Grantham, grantham cemetery, Green hairstreak, green veined white, Hawthorn, hills and holes, hills and hollows, ivy, Lasiommata megera, leicestershire, lolly moor, Lycaena phlaeas, marbled white, Melanargia galathea, Muston Meadows, newborough, norfolk wildlife trust, nottinghamshire wildlife trust, oxfordshire, Pieris napi, Polyommatus icarus, red admiral, ringlet, silver wash fritillary, Silver-washed fritillary, small copper, Small pearl-bordered fritillary, thames, Treswell Wood, Vanessa atalanta, wall brown, Zygaena sp.